Caesars is a name synonymous with gaming at the worlds gaming capital Las Vegas so you may have high expectations of Caesars Bingo. When you land at the site for the first time you are greeted with a rather dull looking home page in comparison with what you may be used to from other brands online. However, what you do have to consider is that the design is in keeping with the brand name. 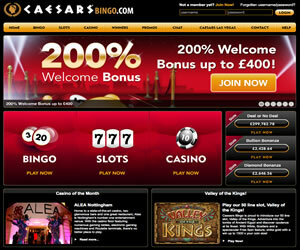 There is a scrolling banner that details some of the best promotions from Caesars Bingo including the welcome bonus and free bingo offering. Additionally you can see current jackpots on the slot games and a casino of the month but little emphasis appears to have been put on bingo, the whole reason we are here. Registration is pretty straightforward and standard to the Gamesys network with no requirements to add your financial details at this point. As soon as the sign up process has been completed you are ready to login and visit the lobby. It is here that you'll find the Caesars Bingo has quite a limited number of options for their bingo '“ just 75 ball pattern and 90 ball bingo is available. From the lobby you can see an array of information including the number of players in a room, the jackpot, the progressive jackpot and the price for tickets. In addition to the 75 and 90 ball games on offer you will also find Super Snap, a card based game exclusive to the Gamesys products. Promotions with Caesars Bingo are probably better than most that are part of the Gamesys network with trips to Las Vegas offered as prizes quite often. 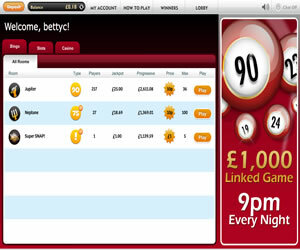 There are always cash back offers available with this brand and free bingo is a regular promotion offered. In addition to all of this there are also linked games and BOGOF bingo games available too. Caesars Bingo doesn't really do the brand proud but if you like the Gamesys bingo offering then you will feel right at home with this brand. 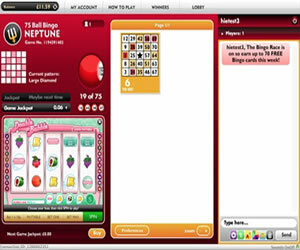 Caesars Bingo offers three different variants of the game at their site; there is 75 ball, 80 and 90 ball bingo to be found across a number of different rooms. 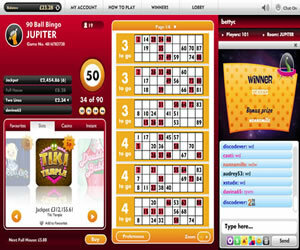 In addition to bingo the site also offers a great selection of instant win games but not all are available in the same window as your bingo game. You are required to wager any bonus received 2 (two) times. Wagering contributions differ dependent on the games you are playing but for bingo it is 100%.